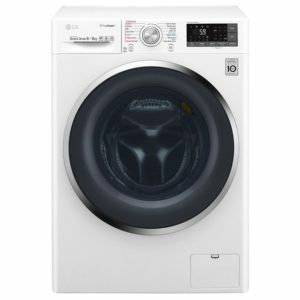 Freestanding washer dryers offer the capabilities of a washing machine and dryer but within the drum of one appliance. This is an advantage when space is at a premium or just to minimise time and effort carrying the load between appliances. Wash capacity can be anywhere between 7 & 11kg; but it’s worth remembering that this is the maximum wash load as the maximum drying load will be lower. Washer dryers offer a large selection of programs to encompass different laundry types, so delicate items, baby clothes, heavy cotton and many more have different wash and drum actions for the best performance. Check out our outstanding freestanding washer dryers below from the likes of market-leading brands like LG, Siemens, Hotpoint, AEG and more. This superb LG EcoHybrid TrueSteam Direct Drive washer dryer has an impressive 1400rpm spin speed, 9kg wash load and a 6kg drying capacity. With an Inverter Direct Drive motor you get less vibration and less noise and Wi-Fi connectivity means you can control this washer dryer from your phone, anytime, anywhere. This model boasts TrueSteam technology which supports allergy care, steam softener and steam refresh programmes. 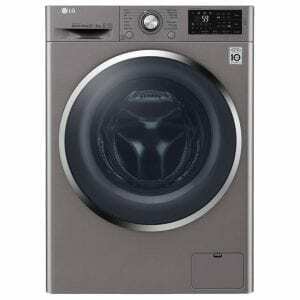 This fantastic graphite Direct Drive washer dryer from LG has a 1400rpm spin speed, 8kg wash load and 4kg drying load, great for small households where space is at a premium. Direct Drive technology ensures that the motor finely controls the drum using electromagnets so it is economical, quiet and incredibly clever. The A energy rating ensures that running costs are kept nice and low, and if you have any troubleshooting, just check out the Smart Diagnosis feature. 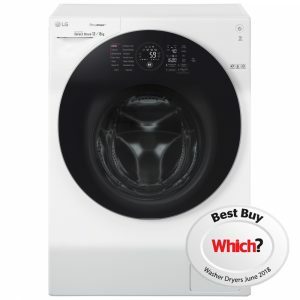 This superb LG Eco Hybrid True Steam Direct Drive washer dryer has an impressive 1400rpm spin speed, 9kg wash load and a 6kg drying capacity. Eco Hybrid technology means you can either save water or shorten the drying cycle. Choose Eco Dry or Normal Dry depending on which you prefer. Eco Dry mode uses no water for drying and Normal Dry mode shortens the entire cycle, cutting back on those pesky energy costs. With an Inverter Direct Drive motor you get less vibration and less noise and Smart ThinQ Wi-Fi connectivity means you can control this washer dryer from your phone, anytime, anywhere. This model boasts True steam technology which supports allergy care, steam softener and steam refresh programmes delivering nothing but thorough cleansing. 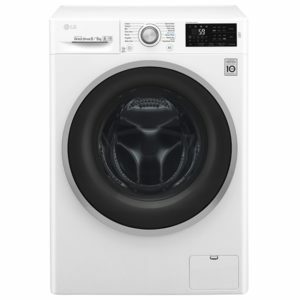 This superb LG TrueSteam Direct Drive washer dryer has an impressive 12kg wash load and an 8kg drying capacity. With an Inverter Direct Drive motor you get less vibration and less noise and Smart ThinQ Wi-Fi connectivity means you can control this washer dryer from your phone, anytime, anywhere. This model boasts True steam technology which supports allergy care, steam softener and steam refresh programmes delivering nothing but thorough cleansing. 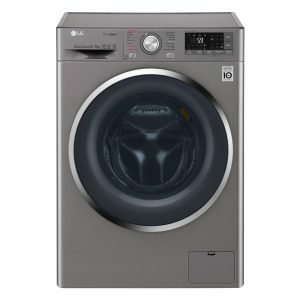 This fantastic Direct Drive washer dryer from LG has a 1400rpm spin speed, 8kg wash load and 5kg drying load, great for small households where space is at a premium. Direct Drive technology ensures that the motor finely controls the drum using electromagnets so it is economical, quiet and incredibly clever. The A energy rating ensures that running costs are kept nice and low, and if you have any troubleshooting, just check out the Smart Diagnosis feature. 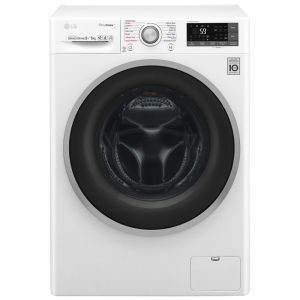 This superb LG Eco Hybrid True Steam Direct Drive washer dryer has an impressive 1400rpm spin speed, 9kg wash load and a 6kg drying capacity. Thanks to its Eco Hybrid technology, this model saves water or shortens the time of the drying cycle depending on whether you choose options Eco Dry or Normal Dry. 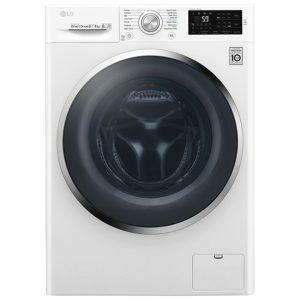 Also, it features LG’s unique 6 Motion Direct Drive technology which moves the wash drum in multiple directions, giving fabrics proper care whilst getting them ultra clean. TrueSteam technology supports Allergy Care, Steam Softener and 20-minute Refresh programmes, which deliver thorough cleansing and garment invigoration, discarding 99.9% of bacteria. Missed that annoying sock and want to add it to your wash? With Pause & Add you can add items to the wash without having to wait until the cycle finishes! Finished in graphite and with an A energy rating, this washer dryer is the ideal choice for your family home.